Fake beef, real flavor! LOL! Ok, I really have no idea where to start with this one. If I said I knew what I was doing or that I wasn’t just a little bit scared while making this dish, I’d be a liar! So, to be honest with you, I totally winged this one and tried some ingredients that I was really unfamiliar with. 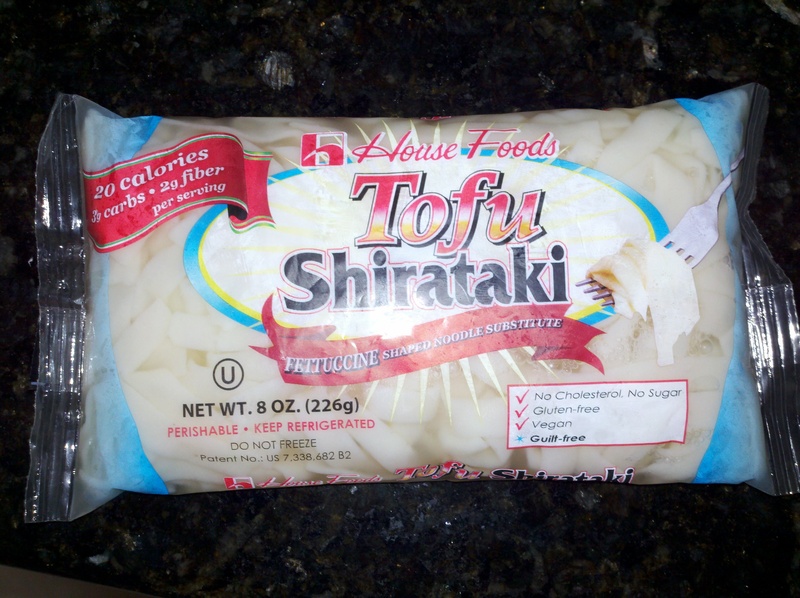 Another thing about this recipe that is different are the House Foods Shirataki Tofu noodles. In the past month that I’ve been cooking with these, I have really come to like them. Mainly because of the guiltless calories they contain. One serving has a mere 20 (that’s TWENTY) calories. I was in disbelief when I first heard this, but lo and behold, that’s what the nutrition label says! The key to preparing these is to get as much moisture out of them as possible before you start doing anything with them, otherwise your dish will end up soupy. I recommend emptying them out in the strainer, placing a bowl under the strainer and microwaving them one minute at a time, gently pressing moisture out between microwaving intervals. Careful now, you know the noodles will be hot since they’ve been in the microwave, so use caution when pressing. Once you have all the water out, they are ready to use however you like. Like I said, I was pretty much winging this recipe by the seat of my pants, and trying to use up some ingredients that were in my pantry. I used a stir-fry seasoning mix that I picked up at the store, probably on an impulse, but I was a reluctant to use too much of it due to how much sodium it contains. I only used about 1 tablespoon of the seasoning due to the fact that it has like 600+ mg of sodium per tablespoon! Ahhh!! And now, for the secret ingredient…BOURBON! Why do you think I was calling the noodles drunk? Just a teaspoon though for the bourbony delicious flavor. First, you want to tackle those noodles. Like I mentioned earlier, get that moisture out and set them aside. Now it’s time to tackle that textured soy beef (lol). Bring about 2 or 3 cups of water to a rolling boil. Add veg protein chunks and boil until they expand and kind of resemble the texture of a little slice of beef! Drain in colander and set aside. Heat oil in skillet on medium heat. While it’s heating, mix the stir fry seasoning with 2 tbsp of water and stir well. 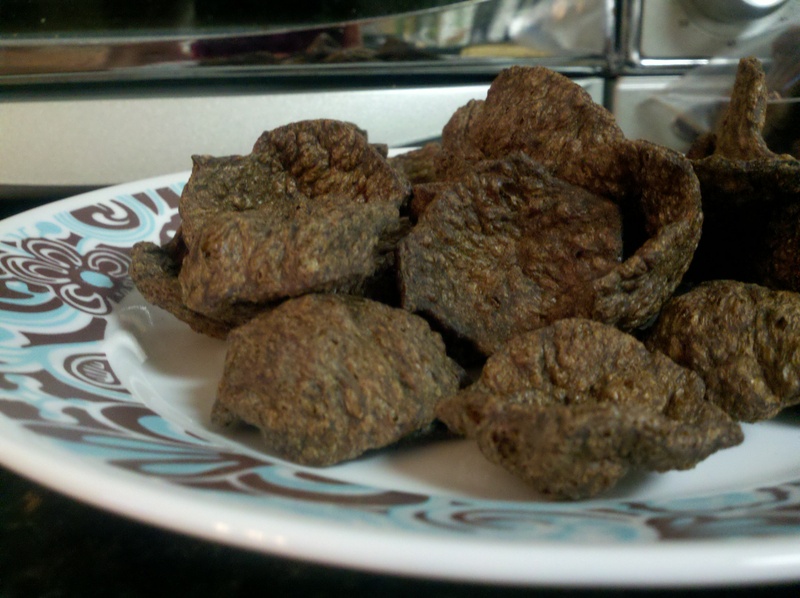 These things usually have cornstarch in them, so mix well. 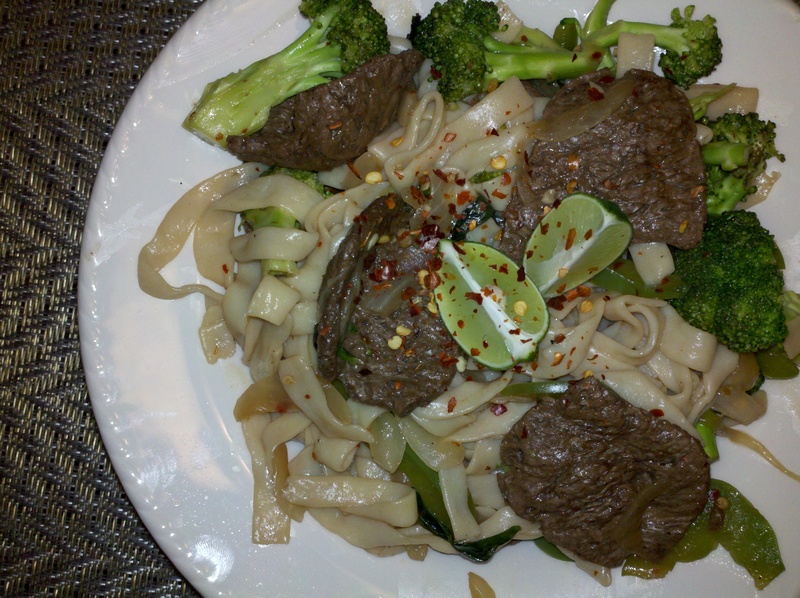 Stir fry veggies and “beef” until veggies start to “sweat.” Add sauce and let it simmer a bit. Add noodles and bourbon. Stir until noodles are covered in sauce and let it cook for about 10 minutes, until all the veggies are done and the sauce as completely thickened. Garnish with fresh key lime slices. So that’s it! That’s my weird and lovely drunken noodles. Like I confessed earlier, I was scared. So I got the Rooster out just in case it was bad. 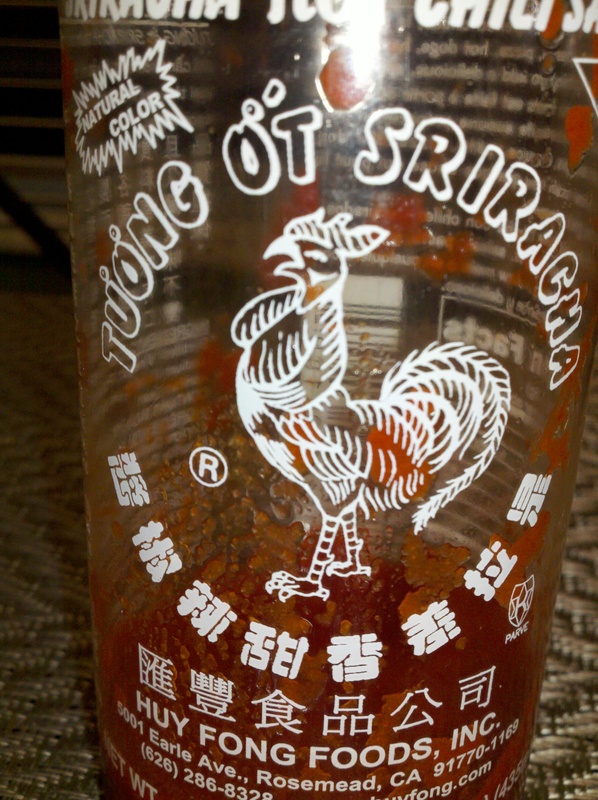 Sriracha sauce by Huy Fong Foods makes the world a better place.